This semester we are working with the American Civil Liberties Union (ACLU) as well as the Guardian Project. The ACLU is an organization whose mission is “to defend and preserve the individual rights and liberties guaranteed to every person in this country by the Constitution and laws of the United States.” Often, because they are more likely to be the targets of government harassment or unequal application of the law, the ACLU works with clients from oppressed groups of people: those who are marginalized because of class, race, religion, gender, disability, immigration status, or sexual identity. The organization also works with activists, who are often also targets of government repression. People within these groups are spied on, arrested, and even deported. It is the mission of the ACLU to help these people get the rights they deserve, and in so doing to expand civil rights and civil liberties protections for all people. The Guardian Project works to build mobile applications that help people communicate more freely, and protect themselves from intrusion and monitoring. Projects we have discussed range from crowdsourcing the location information of surveillance devices, to notifying people when their cell-phone signal is being intercepted. When discussing project ideas, we thought it was important to understand who would use the proposed application, in what ways would they use it, and how would it affect them. Our initial project ideas and thoughts are shared below. The first project we discussed was building a comprehensive dataset of information regarding surveillance devices. This would involve building smartphone applications that enables crowdsourcing the collection of surveillance information. For example, someone could take a phone of a video camera or other surveillance technology and then upload the data anonymously. Building a complete data set relies heavily on user participation and other attempts have shown that it is infact a lot harder than it seems. Moreover, the value-add is limited in that having the complete data does not do much to prevent surveillance. Another idea we had was to begin to suggest a way in which we can diminish the 1% surveyor vs. the 99% participant of surveillance, through interactive systems. In a way that lets the public interact with video surveillance. As the simplest example, Walgreens stores have TVs that let us see ourselves being recorded, “Smile, you’re on Camera,” which acts as the first step in allowing the public to interact with surveillance. The final project we talked about building is an application that alerts users when their cell phone signal may be compromised. This could happen when a cell phone, unknown to the user, connects to an IMSI-catcher (http://en.wikipedia.org/wiki/IMSI-catcher). A simple implementation of this project might alert a user when he or she connects to a tower the device has never seen before. 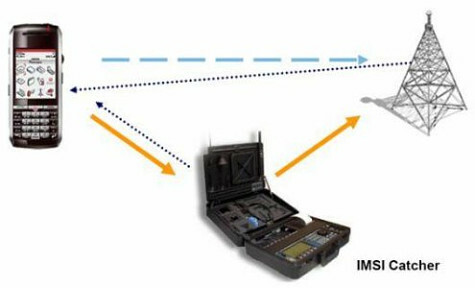 A more robust version might aggregate the data about cell phone tower locations to inform a user when he or she is connecting to a false or unknown mobile tower (IMSI-catcher). The audience for this application would range from technologists to activists, and extend to anyone that’s concerned about their communication being monitored by a 3rd party. The cost of a device that can intercept cell phones signals to monitor SMS messages and calls has dropped dramatically, and so the threat of any number of 3rd party bad actors is something to be concerned about. We have decided to initially pursue the last project listed above (IMSI-catcher detection) after considering pros and cons of each project. This project seems to have the largest audience, and does the most to help people combat surveillance while also revealing to them the vast telecommunications network we are all invisible tethered to.